Jirav makes financial planning & analysis easy, helping you share beautiful dashboards, forecast your finances and report your progress in real-time. The Jirav team is excited to be a part of Quickbooks Connect 2018 in San Jose this year. Join us at our happy hour, stop by our booth and check out our San Jose visitor guide to discover some cool spots around the conference. 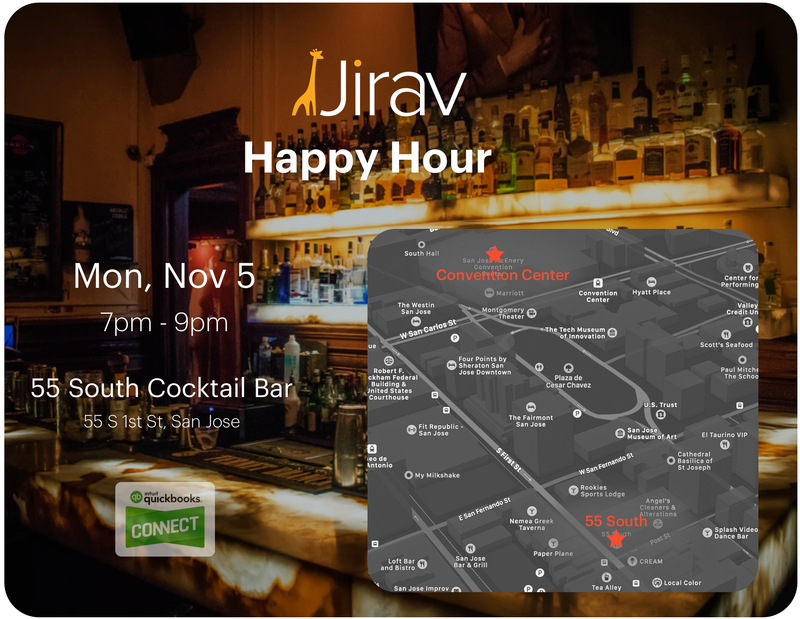 We will be hosting a happy hour at 55 South Cocktail Bar on Monday November 5th beginning at 7pm - join us for free craft cocktails and food. It's just a 9min walk from the conference center. Don't forget to RSVP above and come by our exhibitor booth for drink tickets. We look forward to meeting attendees and fellow exhibitors and sharing our Company story and the Jirav product. 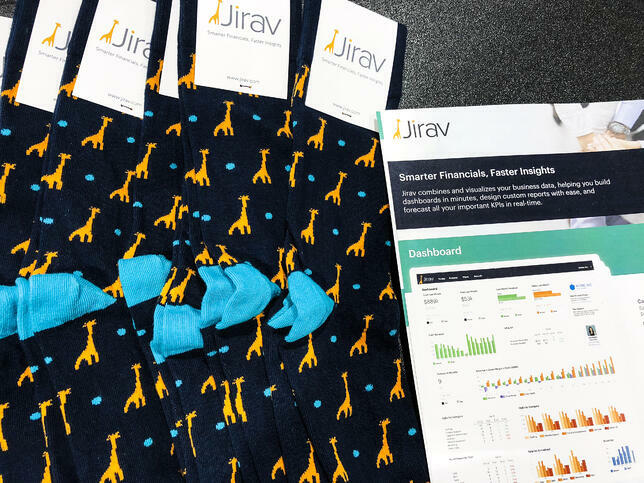 Stop by our booth to learn about Jirav and upgrade your feet with a pair of limited edition Jirav socks. The city of San Jose is central to the Bay Area and many refer to the area as "Silicon Valley" - in fact back in the late 70's the city planners anticipated the growth of the valley to move south and in anticipation of this named a road "Silicon Valley Blvd". As time has passed the valley has grown North toward San Francisco and the growth moving south is only now occurring fifty years later. If you are looking for recommendations, we have hand-picked some of our favorite spots around San Jose. Casual dining that is a local favorite - you walk in and order at the counter then have a seat in the restored oil change drive thru from the early 1900s. The food was featured on Diners, Drive-Ins, and Dives and was a Guy Fiere favorite. A lunch only location that offers house made bread that is fresh from the oven - some of the best sourdough bread in the Bay Area - the location is a cash only so be sure to stop by the ATM on your way there. A visitor must do! Go for the orange sauce and order a taco or burrito. Bay Area residents make pilgrimages to this restaurant for the orange sauce - it is that good. When the Super Bowl was played in Levis stadium between the Broncos and the Panthers, Cam Newton visited this restaurant everyday for the orange sauce. This swanky below ground bar is one of the first speak easy style cocktails bars that have become so popular - the coasters are made from cloth and the drinks contain seasonal local herbs and spices. Get the Pisco Sour for a night cap. Opened by Ray O'Flaherty in 2002 with the same casual Irish pub feel it has today, also hosting a great patio that sits along San Pedro Square. The bar features a large selection of draft beers and is a great place to catch a sports game. This is a large outdoor/Indoor market that has a large food selection from a number of vendors, along with a wine bar and cocktail bar. You can even get your haircut by a local barber if needed. The facility is located on an historic site where the Spanish Peralta Adobe resides and gives tourist a glimpse into the history of San Jose which was the first Civil pueblo in California. A favorite for rooftop bar enthusiast - this bar features a great menu of wines and cocktails as well as some late night food. Located in the center of the college scene with San Jose Bar & Grill and Tres Gringos Cabo Cantina across the street.